Summer is hot and during this season it is hard for dogs to be comfortable. To help them relax we can provide shade and water as well as change when we go for walks. Another means is providing them a cooling mat. We tested the Green Pet Shop Pet Cooling Mat since it had quite a few positive reviews on Amazon. 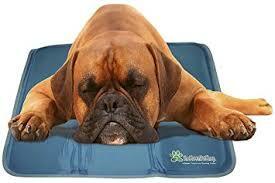 The Cool Pet Pad is pressure activated; as soon as the dog lies down, the cooling effect starts. It cools for up to 3 hours of constant use and recharges itself automatically after 15-20 minutes of non-use. It works without refrigeration, water, or electricity. This particular mat also doesn’t require the use of water which means no mold or leaks. We use the pad in our car to keep the dogs cooler during their commute to Acme. The pads tend to heat up a bit in the car. It is amazing to feel how fast they cool down when you add pressure to the mat. Both Autumn and Penny enjoy the coolness on their bodies . Unfortunately the easy to clean surface doesn’t have much traction so the dogs learned to adjust their balance to compensate for this. Penny has a tendency to be part Beaver. One of the factors we looked for in the cooling mat was a tough covering. After 3 months of use the Cool Pet Pad has not been punctured or cut. 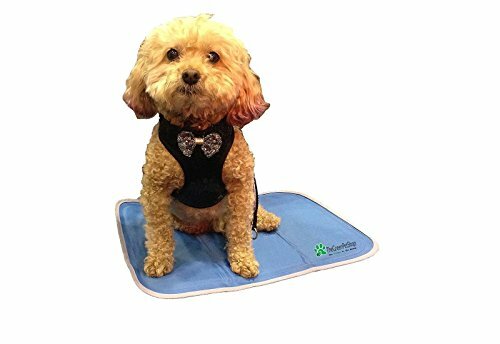 The Cool Pet Pad is easy to fold up and fairly light weight. This convenience is a plus when you need to transport it. Although a bit expensive (ranging from $30 to $70) we feel the Green Pet Shop Cool Pet Pad is deserving of 4 paws for durability and purpose. This entry was posted in Dog Product Reviews and tagged dogs and summer. Bookmark the permalink.